Use the documents and tools listed below for the qualitative and quantitative, occupational exposure risk assessment. 9. Chemical identification, physchem properties and hazard information. For Specific Dutch tools click here (in het Nederlands). Germany: TRGS 402 in German and English . In Dutch: Beoordeling van de blootstelling aan gevaarlijke stoffen en het toetsen van de meetresultaten aan luchtgrenswaarden (2007). In Catalan: Estratègia de mostreig d’agents químics a l’aire. Leidel & Busch NIOSH 173 (1977) Occupational exposure sampling strategy manual. Of perpetual value! EN 689 for a reasonable price. The EU Standard (2018) to establish employers odds to be in compliance with a limit values. Public and private occupational Exposure Databases may be based on the US and EU guidelines on core information for workplace exposure measurements on chemical agents, which made it possible to construct exposure distributions per SEG. DOHSBase not free of charge. 260,000 chemical substances, >30,000 substances linked to >1000 high hierarchy OELV's, >2000 DNEL's and >2000 Kick-off levels. Also hundreds of Biological Limit values. Country specific versions. Below OELV sources are presented in groups of different hierarchy. "Health based only" means that no political, socioeconomic and technical feasibility factors have influenced the value (level & duration) of the OELV. Unbiased means not established or financed by interest groups. Documents published before 1997 may suffer from limited quality control and transparancy. The web sites below contain several hundreds of OELV documents often, however, on the same chemical substances. The OELV's proposed for the same chemical substances may differ in value, reflecting differences in scientific sources used, different hazard assessment techniques (i.e. safety factors used) and differences in hazard perception. Compliance with these limits may safeguard the employer from liability for health claims. TLV's and BEI's US workplace air and biological monitoring OELV's from the ACGIH. Often used in countries with no OELV setting bodies. Unbiased health based after 1996 when corporate influence was ruled out. For the OELVs below the independency from interest groups and/or unbiased science is not guaranteed. NIOSH developed Criteria Documents including the Recommended Exposure Limits (REL). The older RELs may be based on analytical feasibility. REACH DNEL and DMEL. Based on product liability, suppliers needs to provide users of their chemicals guidance on safe work (eSDS). The European CHemical Agency (ECHA) has disseminated the REACH dossiers of twenty thousand substances prepared by suppliers of chemicals in Europe. Of some 5000 substances DNEL or DMEL are derived to safeguard the occupational and general public use for inhalation, oral and skin exposure. The workplace air DNELs differ from OELV's in that REACH is based on the specific use of a suppliers product and not on the whole occupational load during the workers shift (TWA) or task(STEL). Further DN/MEL are derived using fixed administrative assessment used to extrapolate from route/dose/duration/species/response to human/worker inhalation or skin exposure. Epidemiology and human findings are ignored at large in the DN/MEL. However DN/MEL can be used as a starting point for developing a workplace OELV, if higher hierarchy OELV's do not exist. The reference periods "long-term" and "short term" should carefully be considered if converted to TWA or STEL/Ceiling. The long-term inhalation, local and systemic DN/MEL's for the worker can be found in the GESTIS DNEL Database. Most countries have regulatory limits. Non-compliancy may lead to a penalty. EU Binding occupational exposure Limit Values. EU Indicative Occupational Limits Values. adopted as regulatory limits in most EU countries. France valeurs limites d'exposition professionnelle (VLEP) indicative (VL), binding indicative (VRI) or binding restricted (=réglementaires contraignantes) (VRC). OHSA-PEL The federal OELV's, different states like Texas and California have there own OELV's. While the sources under 4.1 through 4.3 mainly contain OELVs for the limited number of data-rich substances, most substances do not have an OELV, due to the lack of sufficient and relevant high quality human health & toxicology data. However if GHS or CLP health H3##-statements are known, Kick-off levels can be established. H3##-statements to derive a Kick-off can be found in the ECHA database with hazard classification and labeling information for all harmonized (6000) and notified (>100,000) dangerous substances in the EU. Kick-off levels are used as a conservative starting point for compliance testing. Since 2018 the online version of BWStat developed by Tom Geens (Liantis) is available at the site of the Belgium Society on Occupational Hygiene. It replaces the Excel tool BW_Stat_v2.1 released at the IOHA-BOHS conference 2015 in London. BWStat performs several quantitative quality checks, the EN 689 preliminairy (N=3->5) & the statistical test (N=6->50), and the BOHS-NVvA between & within worker analysis. to optimise the range of outcome from which GM and GSD are calculated using censoring in the lognormal probability paper plot and the Shapiro and Wilk goodness-of-fit test. to calculate Land's Upper Confidence Limit (UCL) for the arithmetic mean (for long-term dose). to combine prior knowledge on GM and GSD with new sampling data (better than Bayes). EXPOSTATS from Jérôme Lavoué of the University of Montreal. In English and French. His Bayesian approach requires hardly existing knowledge on priors of the exposure profile analysed. NDExpo uses (like HYGINIST) the regression of detectables and corresponding Normal Order Statistics/Rankits for point estimates of the non-deductible. the 'employers friendly' maximum likelihood test. This test is asymptotic unbiased, meaning that the underestimation of non-compliance increases if sample size decreases and GSD increases. the 'unrealistic' UTL95%,95%. Its tolerance limits are for sample size 6 or below and GSD>3 so wide that theý often exceed the range of natural (vapour pressure, dustiness) limits. Based on observations in different countries and many situations (Oldham UK 1953, Coenen GE 1966, Leidel US 1977) it is widely accepted that the body of a workplace air exposure distribution is well represented by the lognormal distribution. In the tails of the exposure distribution (<5% or >95%) the lognormal shape may not fit as it can predict probabilities for non-existing or non-realistic concentration. For example concentrations that exceed physicochemical limitations like maximum dustiness for airborn solids, the atmospheric pressure for a gas or the saturation concentration for vapours. The sample Geometric Standard Deviation (GSD) is the descriptive statistic for the variability (=dispersion) of the exposure data and responsible for the extrapolations in the tails in lognormal distribution. the unbiased estimator of the population GSD [EXP(σ)] with minimum variance. This means the most efficient estimator with an expectation equal to the population EXP(σ). And this means in simple wording that the GSD equals EXP(σ) on the average for every sample size. by definition lager than one plus the analytical coefficient of variation (1+CVt) (NIOSH 77-173 p124) . considered to be an intrisic property for every substance/Similar Exposure Group(SEG) combination, or its REACH equivalent the workers task/activity Contributing Scenario (t-CS). Space-time factors like global positioning and altitude, local climat and its variability througout the year. 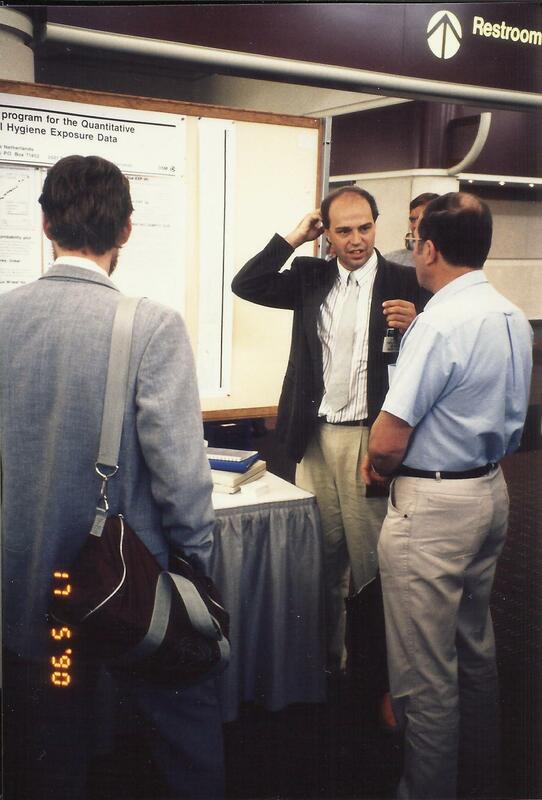 Kromhout and Rappaport (1993 table 6). The median (50%-tile) GSD's found for different production factors within single workplace SEGs range between 1.7 and 3.6 . These GSDs may even be too low as 0.5*LOD was used for the non-detectables up to 25%. TWA8 hours PAS measurements of SEG's in modern chemical industry using well performed sampling plans and regression statistical analysis for non-detects show GSD's up to 14. See BOHS Conference 2013, GSDs in the real world and The distribution of long-term GSD's in chemical industry SEG's (in Dutch , English summary). highly controlled indoor workplaces, clean rooms etc. So in a clean room and other situations where one would expect a GSD at or just above 1+CVt, higher GSDs may indicate suboptimal controls or bad technical sampling and/or laboratory handling. The resistance against high GSDs in IHStat may also be caused by the bad performance of the two noncompliance statistics with GSD>3 and sample size <6. when officers in charge forbid their industrial hygiene sergeants to report GSD>2. EN 689 (2018) supports a preliminary test in 5.5.2 for sample size 3,4 and 5. Its use is justified by the INRS document ND 2231. The document shows that the use of the preliminay test is only justified for GSDs below 3-4.
the Effect specific additional exposure index for mixtures: miXie. The three methods above imply, that the appraiser samples all components in the mixture. Another approach for vapors with comparable effects is to select the most critical component (based on the saturation concentration and the OELV) and to adjust its OELV to the composition of the mixture in the air. XLUNIFAC is the method of preference. the Raoult and XLUNIFAC method for liquid mixtures. Adjusting the OELV of the lead/critical component, becoming representative for the whole vapor mixture. Even if the fugacity of the components behaves non-ideal. the Critical Component or DPD+ approach. TREXMO (TRanslation of EXposure MOdels) integrates six commonly used occupational exposure models: ART v.1.5, STOFFENMANAGER® v.5.1, ECETOC TRA v.3, MEASE v.1.02.01, EMKG-EXPO-TOOL and EASE v.2.0. EPI Suite is not only a large database with measured physchem data but also with physchem estimates based on the SMILES code. Databank Grenswaarden Stoffen op de Werkplek van de Social Economische Raad (SER-GSW) met Europese werkplek atmosfeer grenswaarden en REACH DNELs. Veilig werken met chemische stoffen.nl Door de sociale partners binnen de SER ontwikkelde leidraad voor het veilig werken met chemische stoffen. Hiermee is het gat gedicht ontstaan na het afschaffen van de meeste wettelijke en bestuurlijke MACs in 2007. Het bevat ook de goede praktijken die in de afgelopen decades zijn ontwikkeld door bedrijven en branche verenigingen. AI interne instructie toetsen van de meetresultaten aan luchtgrenswaarden (2007). Bij de beoordeling van de blootstelling is voor veel stoffen de bijdrage van de opname via de intacte maar onbeschermde huid belangrijk. Van de homepage van Wil ten Berge is het freeware programma SKINPERM te downloaden dat op grond van een aantal fysisch chemische parameters de potentiële huiddoorlatendheid van een gas, damp of een vloeistof schat. En met aanvullende gegevens over kleding, besmet oppervlak e.d. wordt de mogelijke opname in het lichaam geschat. Een goede aanvulling dus op NEN 689 die volledig op de werkplekatmosfeer is gefocust. Als vloeistof of opgelost in een vloeistof met de huid in contact komt. De opname van vaste stoffen en aerolsolen is niet met SKINPERM te schatten. Paul Schepers, wetenschappelijk onderzoeker bij de Universiteit Nijmegen, heeft het zoeken naar toxische eigenschappen van chemische stoffen op het internet wel zeer gebruiksvriendelijk gemaakt. Zijn afloopschema Patchwork leid je naar de meest betrouwbare, publiek vrij toegankelijke, databestanden.